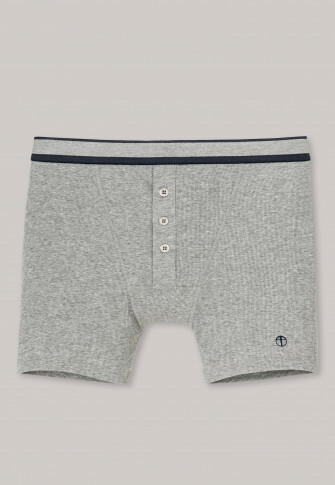 Underwear for a man's man: These mottled gray, close-fitting men's shorts from the SCHIESSER "Outdoorsman" line combine an iconic design with a perfect fit. Elastic double rib and the striped, woven elastic waistband ensure a comfortable, soft feeling on the skin and can also visually score with the metal-colored button placket and the classic crossbow logo on the leg. Perfect for men, who appreciate the ruggedly good-looking basics in best SCHIESSER quality! Sehr schönes Stück, angenehm zu tragen, sitzt bestens, tolle Qualität.